A poorly-executed plan termination could result in your plan not being properly terminated -- or worse -- you could be facing an audit. Terminating a retirement plan can be daunting. There is a lot to do and if it’s not done correctly, it will generate even more “to dos”. To minimize the sense of being overwhelmed break down a plan termination into five smaller phases. Terminating a retirement plan is complicated. The importance of having a well thought out plan in place before beginning the plan termination process is imperative, because making mistakes can be costly. 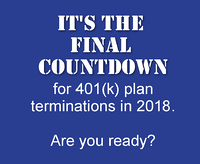 To better understand why plan sponsors were making mistakes in qualified plan teminations the IRS Employee Plans Compliance Unit conducted a “Termination Project” in 2011. Over 75% of the sampled sponsors made errors! Terminating a retirement plan takes a lot of work, a lot of planning and requires specialized skills. Not surprisingly, most fiduciaries choose to outsource plan terminations to service providers. Selecting an outsourced provider is a critical decision. To help simplify the process we suggest using five criteria.